I’m fast realising that you need to be prepared for every eventuality and with the bambino sprinting around at high speed and getting knocks and scrapes, suddenly the idea of having a little first aid kit on the go is seeming rather attractive. 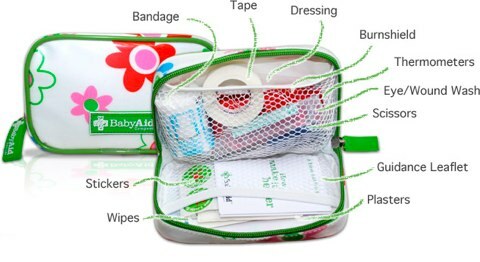 Of course, considering that I’m already an everything but the kitchen sink kinda gal, it’ll need to be compact so I’m liking these new BabyAid first aid kits that despite the size (15 X 10 X 5 cm), contain a cheeky 33 items plus there’s a little room to add your own bits and bobs. They’re £14 each plus you can buy refill packs starting from £11 plus they stock a large selection of separate items.